Dentures are made to be very durable just like real teeth. They are able withstand the everyday tasks of chewing and eating. However, just like real teeth, they are not unbreakable. You still have to be careful with them, especially when you are handling them when removed from your mouth. In the event that you dropped your dentures and they broke, you may feel the urge to repair it yourself by using Super Glue. This is highly advised against because Super Glue is poisonous and you are more susceptible to swallowing the glue since the dentures will be in your mouth. You also may end up damaging the dentures more by trying to fix it yourself. The only real solution would be to immediately contact-us, we may be able to fix it on the same day. If your dentures start to cause pain or sores in your mouth, it may be a sign that your dentures are not fitting properly and you need to get new ones. Unlike real teeth, dentures do not change with your body and are not flexible to accommodate these changes. As we grow older, our bodies change and our jaws are of no exception. The only solution to fix this denture problem would be to contact our office for appointment and have new proper-fitting ones made. Even if you are not experiencing any pain or sores, it is always recommended to periodically have a dentist check the fitment of your dentures. Like real teeth, dentures need to be brushed every day. However, there are additional steps you must take to properly care for your dentures and keep them clean. One of the most important steps is to remove your dentures and rinse them out with water after eating. Another step would be to soak your dentures overnight in denture solution after cleaning them. Before putting back your dentures in the next morning, it is very important to rinse off the denture solution as it contains chemicals unsafe for consumption. 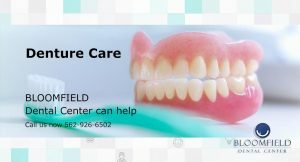 When cleaning dentures, you must use products that are specifically designed for dentures. Normal cleaning products for real teeth are not suitable for dentures and are likely to damage them. These products include whitening toothpaste and stiff toothbrushes. It is also important to avoid exposing your dentures to hot water, which may warp the shape.